How Do I Change My Uplay Username? How do I change my Uplay Username, and what do I need to know about it? What is the difference between my Legacy Username and my new Username? 1. Visit and login to our Account Management page. 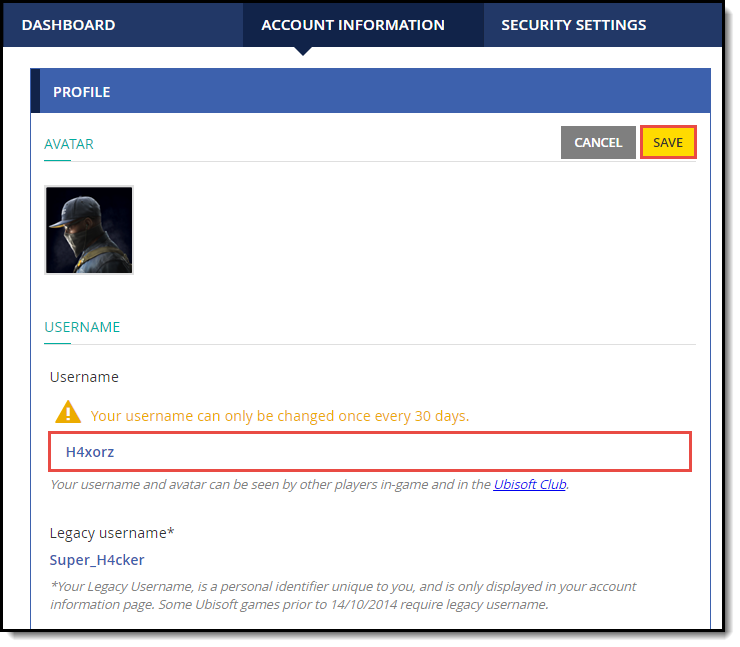 Your current Username and your Legacy username can both be located in the Profile box. 2. Click the Edit button at the bottom of the Username section. 3. The Username field will now be available for editing, so make the changes you want! 4. Once you are done, click on Save to keep your changes. Your Legacy Username is a personal identifier displayed in your account information page only and is unique to you. Your Legacy Username will be required for Ubisoft titles prior to October 14th, 2014. Your Username (display name), a personal identifier as well, appears in your profile on Club.ubi.com and is displayed on Ubisoft Club-enabled console and PC titles (friends list included) as well as an in-game alias for all Ubisoft titles, starting October 14th, 2014. Your new Username will automatically be your current Username until you decide to change it. You can only change your Username once every 30 days. - Usernames must start with a letter. - Usernames may contain letters, digits, underscores (_), dots (. ), and dashes (-). - The length must be between 3 and 15 characters. - Words considered vulgar or offensive are not allowed as any part of the Username. - It cannot start or end with letter combinations reserved by the company (i.e. ubi_ or _ubi). - Refrain from using any real-world indicators (like your actual first/last name) since your Username may be visible to other players in multiplayer game modes. - Choose your Username carefully. Once an account has been created, you can edit your display name from your Ubisoft Account Management page. Changing your Username is not a decision to be taken lightly. Remember, your Username can only be changed once every 30 days! If you do decide to change your Username, you won't lose your saved games, your friends list, or anything else! What do I need to know about 2-Step Verification? How can I change the email address on my Ubisoft Account?